Roger Highfield, science editor of The Daily Telegraph and author of The Arrow of Time, takes an offbeat look at Christmas by examining it from a scientific perspective. Can Reindeer Fly? ranges across every field of science--from cloned Christmas trees and the genetic defect that makes Santa so plump, to warp-drive sleights and the physics of snow-flakes--and disentangles they myriad cultural influences that come together to make up our modern Christmas. What are the thermodynamics involved in cooking a turkey? Is the concept of a virgin birth scientifically feasible? What happens to us physically when we overindulge in alcohol? Do people really feel more depressed around Christmas? How does Santa manage to deliver all those presents in one night? (He has, in fact, little over two ten-thousandths of a second to get between each of the 842 million households he must visit.) 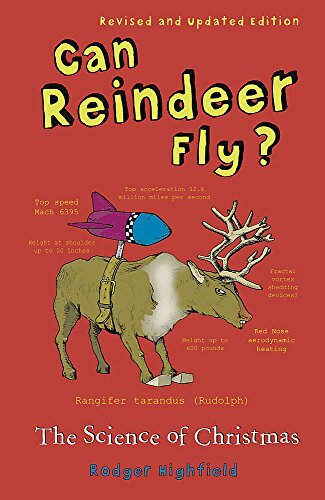 With topics ranging from "The Decline and Fall of Virgin Births" to "Christmas Astrology"; from "Santa: The Hallucinogenic Connection" to "The Dreadful Sprout", Can Reindeer Fly will convince you that Christmas is for everyone-- even scientists. ﻿Picked up at the Showroom. Beebarf would like me to set up a Ray for this book once I have finished it. When I have read this book it will be going on a ray. Everything you could ever want to know (and more) about possible identities for the Star of Bethlehem, mechanisms for virgin birth, the psychology of giving, the properties of snow and many other Christmas related subjects. Parcelled up and ready to go the next time I pass a post office. Should be on its way to AnglersRest in the next few days. The historical information appealed to me and I found this to be a fascinating book and one that I enjoyed more than I thought I would. Thanks for sharing. I have the address for molekilby, so the book will continue it's journey on 24th October. Received today thanks. Just finished one book today so this has come just nicely. Will read and pass to nice-cup-of-tea. Enjoyed reading this book. It did get very technical at times, but some of the information was quite useful and some tongue in cheek. I learnt quite a bit and no doubt will bore people as I recount these nuggets of knowledge over the forthcoming weeks.